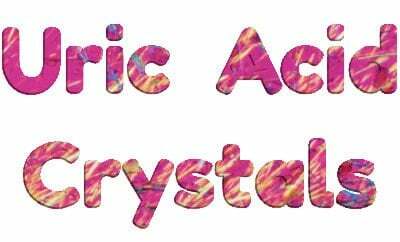 Uric Acid Crystals explains how crystals form in your body when you have excess uric acid in your blood. Then I look at their consequences, and how you can dissolve them to stop gout permanently. So if you want to truly understand gout, you must learn why uric acid crystals happen. Because you need to control uric acid crystals in order to control gout. I wrote Uric Acid Crystals for anyone who wants to understand uric acid and gout. Because I believe that gout is easier to control when you understand how uric acid causes gout pain. So, in this part of my website, I focus on learning and understanding. But if you prefer practical steps for overcoming gout, I recommend you start with Questions for Gout Sufferers. Can Uric Acid Crystals be Dissolved?. Uric acid crystals form when levels in the blood get too high. Then those crystals are what cause gout flares. But there is no set level as each gout sufferer is different. Therefore I start this section with a look at the factors that affect crystal formation. Once uric acid crystals have formed in and around joints you are on the road to gout. Yet again, each person is different so we look at the effects of crystals in your body. Because the typical response to urate crystals is gout pain. Yet there are other more serious effects of gout crystals. Most importantly, I finish with a look at how you stop, then reverse the uric acid crystal processes that lead to gout pain. Complete with links to related information and how to get personal help. What factors affect the formation of Uric Acid Crystals? In this subsection, I describe factors that affect crystallization. Especially avoidable factors such as low temperature that you can avoid. Because they show ways that you can reduce the risk of gout flares. Uric acid crystals are the scourge of gout sufferers. But why do they hurt so much? Definitely not because they are sharp. See how urate crystals trigger your immune system responses. What are the effects of Uric Acid and Gout Crystals? We’ve looked at gout flares, but there are more serious dangers of gout. So in this subsection, I describe how gout crystals cause damage, disfigurement, and death. Can Uric Acid Crystals be Dissolved? Finally, we’ve seen all the reasons why uric acid crystals cause gout pain. Together with factors that we might control to avoid them. But the big question remains – can uric acid crystals be dissolved? So, I am preparing a series of articles that explain how uric acid crystals can be dissolved. In the meantime, I recommend you read How long does it take for Allopurinol to Lower Uric Acid Levels. At the moment, I do not have a specific section of my website for uric acid crystal images. Instead, I include them with my complete set of gout and uric acid pictures. However, if there is sufficient interest, I will add a section for uric acid crystal pictures. What do your uric acid crystals look like?